Blues in A backing track for blues guitar practice. 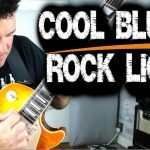 Practice along with this track to improve your blues soloing, blues chords, blues riffs, time feel, improvisation and lots more. This blues track is in the key of A and is based on a 12 bar blues form. This is the most common chord pattern in blues music. In the key of A it uses the chords A7, D7 and E7. Try playing the chords over it to improve your rhythm guitar chops! 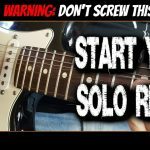 If you want to solo over this backing track then the most common approach would be to use the A blues scale or the A minor pentatonic scale. There are other choices, but these will give you that classic blues sound. So try out all those tasty blues licks and bends you’ve been working on. When soloing remember to leave space between the phrases and to use some repetition. There’s nothing wrong with playing the same licks round and round with slight changes, in fact this is an important part of learning to play great blues.